You know I really like a recipe when I make it two days in a row. I first made this dish for dinner last night, and though I liked it and my husband thought it was “outstanding,” I still wanted to tinker with the recipe. It was good, but I thought it could be incredible. So this morning I got to work, making a couple of small changes, and boy am I glad I did. A good recipe got even better—and I got an amazing lunch! 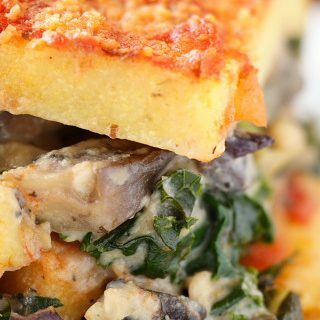 Despite the long list of ingredients, this dish is pretty easy to put together, especially if you use packaged polenta and jarred marinara sauce. You’ll probably spend the most time preparing the kale, but you can even cut out that task if you substitute bagged spinach instead. If you use packaged polenta, slice it into 18 thin slices. If you make your own polenta, spread the cooked polenta out on a baking sheet and use a spoon or your moistened hands to spread it no thicker than 1/4 inch. When it has solidified, either cut it in half and use each half as one layer or cut it into an even number of pieces that you can fit together to fit your baking dish. Preheat oven to 375° F. Spray the bottom and sides of a 8×8-inch baking dish with non-stick spray and set aside. Place the cheese sauce ingredients into a blender or food processor and puree until completely smooth. Set aside. Sauté the onions and portabellas in a non-stick skillet until the mushrooms begin to exude their juices. Add the garlic and sauté for one more minute. Add the kale, basil, and 1/4 cup water. Sauté until the kale is wilted and tender and the water has evaporated. Add the cheese sauce and cook, stirring, until thickened. Check seasoning and add salt and pepper if needed. Remove from the heat. Cut the polenta into 1/4-inch thick slices. Line the bottom of the baking dish with half of the slices, overlapping slightly if possible. Spread 1/2 cup of the marinara sauce over the polenta, and then spread the kale mixture over the sauce. Sprinkle the chopped olives over the kale and top with the remaining polenta. Spread the remaining marinara sauce over the top and sprinkle with soy parmesan, if desired. Bake for 25 minutes. Remove from oven and allow to cool for 5 or 10 minutes before serving. Makes 6 servings—if you can resist eating the whole pan yourself! You can lighten this up a little by using low-fat silken tofu and fat-free soymilk. This looks amazing and I’m dying to make it! One Q before I begin: I’m not sure what extra-firm silken tofu is – on-hand I have both extra-firm tofu and silken tofu – which should I use for the cheese sauce? Thank you! It’s different than the refrigerated kind of tofu that’s packed in water. Hope the link comes through when I post, and hope you enjoy this great recipe! Thank you so much for filling me in, Kristin! While I’m definitely going to invest in some mori nu in the future, I was dying to make this tonight – knowing I had no work and to celebrate the end of the week. 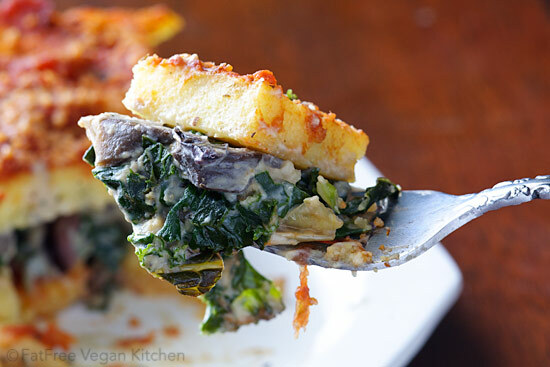 I used the extra-firm tofu I had in the fridge and…OMG this lasagna is heaven in an 8×8 pan! Love love love it! For the fifth time/recipe now Susan has done it again! So happy to know about this blog. Hats off to you, Susan! I just made this and ate half the pan in one sitting. So tasty. I can’t wait to make this for a church potluck. My gluten free friends will love this. Hi Susan, this is one of my favorite recipes on your site and I make it all the time! I was wondering if you have any tips to make it serve 20. I’ve doubled the recipe before and baked it in a 9×13 pan, but I need to make an even larger one for a holiday party. I also need it to be easily transportable because the party isn’t at my house. If you have any advice, I would really appreciate it! Thanks! I’m so glad you like it! I think doubling it is about as far as you can go and still be sure it cooks all the way through, so I suggest making 2 9×13 pans. Anything bigger and it probably won’t get done in the middle without burning the edges. Hello!!! I’m a flexitarian and my roommate is vegan. We have roommate dinners once a week, alternating who cooks. I made this recipe this week and it was AMAZING!!! We both loved it so much! I brought the left overs to work and had my coworker try it. He’s a meat eater and gluten-free (which this recipe is totally gluten free too!)…. He thought it was really really good and he doesn’t usually even like lasagna! I tried this tonight, but instead of using tofu for the sauce, which has a chalky taste I’m not fond of, I made a batch of OMG Walnut Sauce from “My Beef With Meat”. It uses walnuts which are lower in fat than other nuts, and I added some yeast seasoning. It made a great tasting dish! I made this and also added shaved broccoli. This recipe is amazingly delicious! 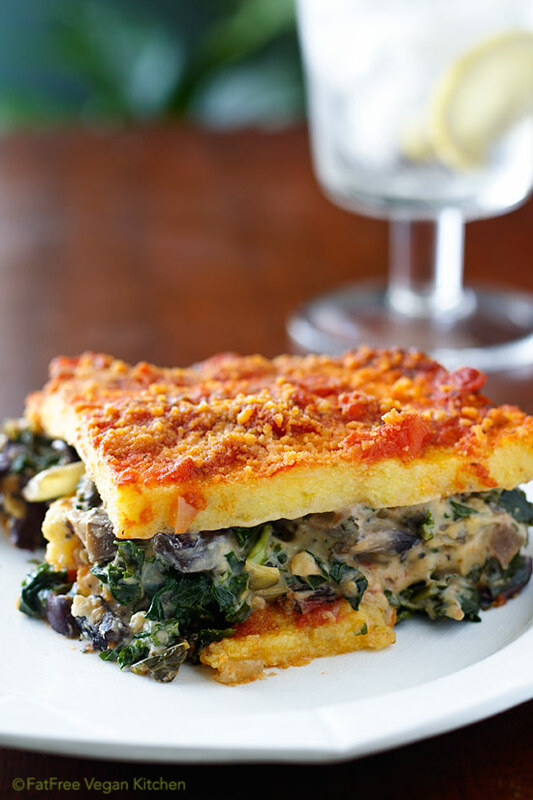 Am going to try it next time with still warm polenta layers. I think it will hold it together better! I’m so excited to try another one of your amazing lasagnas! Any thoughts on how to make this eat-to-live friendly? Thanks, Susan! I’m browsing your recipes this fine Sunday morning. I’ve made this recipe a few times before and LOVE it – it’s a favorite! But I was wonding what I can sub for the mori-nu tofu. I usually have some on hand, but don’t and the HFS isn’t close. Do you think upping the cashews would work or do you have another idea? I think extra cashews would make a really delicious sauce. I made this a few weeks ago and it was DELICIOUS! Even my very picky and “health food”-leery husband loved it. I did use pre-cooked tube polenta (sliced), frozen spinach instead of kale, ground oats instead of cornstarch, pepitas (hulled pumpkin seeds) in place of cashews, and 1 chopped zucchini in place of the mushrooms (because it was going to go bad). I heartily recommend that substitution! Also, a whole jar of Rao’s “Garden Vegetable” tomato sauce made this dish simply irresistible. I plan to save this recipe forever and make it for other guests. Thank you! I so love Italian food and because I make this so often, I got to wondering if you have a category for Italian recipes. As always, thanks so much for continuing your blog. The photos are spectacular and the recipes more than satisfy the taste buds!!! You make vegan eating so doable and flavorful! THANK YOU so veryvery much for your specificity on the amount of kale…I am so annoyed by recipes that just say ‘1 bunch of kale, destemmed and chopped’ which is especially unhelpful when the ‘bunch’ comes from my gatden. This looks delicious! I made this the other day, and I have to say, this is my favorite vegan recipe I’ve made in 30 years! So good. I brought it to work and shared it with non-vegans and it was a hit! Can’t wait to try your other recipes. I just made this again, and every time I make this it is as wonderful as it was the very first time. I am stunned at how good this cheese sauce is, and the mixture of kale and mushrooms makes it spectacular. I think I’m going to try this with eggplant instead of polenta the next time I make it — something tells me it will be just as good. Thank you for such a great recipe — I always double it so I have lots of leftovers. My husband and I love this. I use 2 big mushrooms and almost a whole jar of Trader Joes fat free marinara. Only use 1 tbsp of tahini and leave out the olives and cheese because we need to follow a very low fat diet. Incredibly delicious! Another hit recipe! I was craving polenta on this very cold and rainy day. So I did a quick recipe search and realized I had all the ingredients for this dish on hand (though I did sub brown mushrooms for the portabella and spinach for kale). I have made similar cheez sauces before, but there was something extra delicious about this one. Mixed in with the spinach and mushrooms, I could have eaten the whole pot just like that! But I remembered that the polenta was what brought me here, so I proceeded with the recipe, and it turned out perfectly. Super easy and quick to make too. I’ll be making this again. Thank you, Susan. Great recipe! I also added chopped roasted red peppers when I added the garlic. I doubled the recipe and put it in a 10×16 pan. Seemed to cook just fine, but I needed more than 2 of the polenta rolls, so I made some thick grits to fill in the gaps. Thank you for your recipes!! Thank you for this delicious recipe! I came across it from your Facebook feed while I was making my grocery list. I followed the recipe exactly, only used unsweetened coconut milk (from the carton) as I never keep soy milk (just never like the taste of it). The coconut milk definitely made the cheeze sauce taste a little… off… but I found adding a bit extra salt, white pepper and onion powder helped with that. I also used regular refrigerated silken tofu – I’d forgotten there are shelf-stable versions that vary in firmness – so the sauce was definitely quite runny, but it still tasted delicious. I’m going to make this again – hopefully this time I can find the correct tofu. And at 180-odd calories per serving, there’s definitely NO need to feel guilty eating two servings in one sitting!